The Gold Plated Fine Cocktail Strainer is the luxurious way to create professional cocktails. 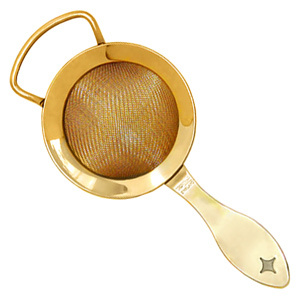 With an ultra fine mesh and designed to fit over a cocktail shaker tin, this cocktail strainer gets rid of any unwanted fruit, pips or ice shards. With a mini sieve, you can make ultra smooth cocktails or drinks with ease. The gold plating provides a luxury quality that every bar would be proud to show off.